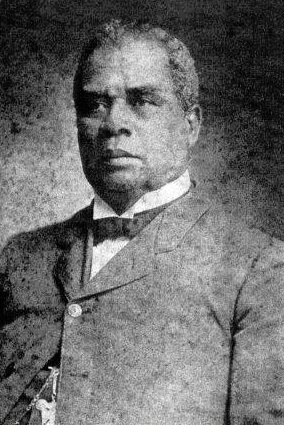 Pierre Caliste Landry, a former slave turned educator and minister, is noted as the first African American to be elected mayor of a town in the Unites States. Landry was born into slavery on April 19, 1841 on a sugar cane plantation in Ascension Parish, Louisiana. He was given the name Caliste at birth by his mother, Marcelite, an enslaved cook on the plantation, and his father, Roseman Landry, a white laborer. Caliste was sent to live with Pierre Bouissiac and his wife Zaides, a family of free African Americans and was educated at a local school for free children. However, despite his owner’s wishes that he be freed, Laundry, at the age of 13 was sold for $1,665 to the Houmas Plantation, whose owner was Marius St. Colombe Bringer. The Bringer Family owned over 35,000 acres of land on various plantations. Landry was allowed to continue his education in the plantation schools and live inside the family mansion. After working various positions, Landry was appointed superintendent of the yard and allowed to form a business partnership with the head butler on the plantation. They operated a plantation store, selling candies and goodies Landry made. In 1866, Landry, now freed by the 13th Amendment, changed his first name to Pierre and moved to the African American community in Donaldsonville, the former capital of Louisiana between 1829 to 1831. Within a year, he started two day schools and a night school for the children, built the first home owned by a former slave, and opened a small store. Two years later Landry had become one of the town’s most prominent citizens and that year (1868), he was unanimously elected as Mayor of Donaldsonville, making him the first African American to be elected as mayor of a town in the United States. He served for one term, and additionally served as a Justice of the Peace, member of the Ascension Parish School Board, and Superintendent of Schools. In 1870 he was elected President of the Police Jury and an appointed Tax Collector for his town. Two years later Landry was appointed Postmaster of his town by President Ulysses S. Grant and elected to the State House of Representatives. Landry was also responsible for founding the third African American College in Louisiana, New Orleans University, which later became Dillard University in 1935. Pierre Landry became the State Senator for the 8th Senatorial District of Louisiana in 1874, where he served one term, and in 1879 he was elected to represent Donaldsonville as a delegate to the State Constitutional Convention. After the Civil War, Landry converted from Catholic to Methodist and helped establish and served as Pastor in nine parishes across the state from Shreveport to New Orleans. Landry had a combined 50 years of service as a minister. He also practiced as a private attorney for 12 years. Landry married Amanda Grigsby in 1867 and together the couple had twelve children. After her death, he married Florence Simpkins and together they had two children. Unusual for that era, all fourteen of his children attended colleges. Pierre Caliste Landry died on December 22, 1921, in the Algiers Section of New Orleans, Louisiana. He was 80. Honorable Pierre Caliste Landry – First Mayor of Color in U.S.